The story started in 1900 when talented design engineer John Weller, joined forces with John Portwine, a businessman who possessed great foresight. Portwine owned a chain of butchers' shops in London. The prototype Weller car appeared in 1903, but production difficulties arose for this up-market and advanced vehicle, and it was sadly abandoned. They decided to attempt something less ambitious, and Weller designed a small commercial vehicle called the "Autocarrier". It was 3 wheeled, with a single cylinder engine driving the rear wheel. It was produced from 1904 in West Norwood, London, and was a great success, with numerous well known shops and merchants in London running fleets of Autocarriers. The Weller/Portwine company was known as "Autocar and Accessories Ltd."
The company reformed as "Autocarriers Limited" in 1907, and a passenger version of the 3 wheeler was introduced. "Autocarrier" was abbreviated to "AC", and this passenger version was called the "AC Tricar". The driver sat at the rear, with a lower seat in front for a passenger. Subsequently, an alternative version with the passenger alongside the driver was introduced, and this was called the "AC Sociable". 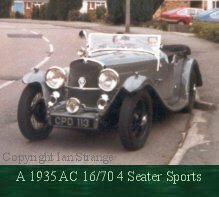 In 1911, production was moved to the village of Thames Ditton, Surrey, and the company became "Autocarriers (1911) Limited". The success of these little vehicles meant that Weller could pursue more ambitious plans for 4 wheeled sports cars. The first ones appeared in 1913. These were of very light construction, using aluminium alloys to save weight, including unsprung mass of the transmission/axle. How light? The whole car weighed about 10cwt (500kg)! It featured a gearbox in unit with the rear axle, many decades before other sports car makers made a big deal about this attribute! The engine was a 4 cylinder, 1.5 litre, "Fivet" from France, which provided a top speed of about 45mph (72km/h). 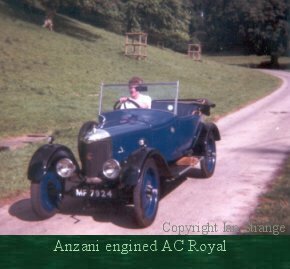 After the 1914-18 war, 4 wheeled car production resumed, but the engine soon changed to an "Anzani" 4 cylinder unit. Tricar production does not appear to have been continued after the war. "The Finest Light Six and Still the Finest"
By this time, Weller's masterpiece was already in the making. During the war, he had managed to work out the design for a light-weight 6 cylinder engine, and the first one was constructed in 1919. It was an out-standing design with a wealth of advanced features. Aluminium alloy was employed for the block/crankcase and sump. The combustion chambers were part spherical with inclined valves. There was a single over-head camshaft driven by a vertical shaft via skew-gears. This proved too noisy and so an inverted tooth chain was substituted. This was the world's longest timing chain, and the potential pitfalls were eliminated by Weller's patented chain-tensioner - a simple spring steel strip. The cylinders were wet liners. Power output was 40bhp. The company name changed again in 1920, to "Autocarriers Limited". 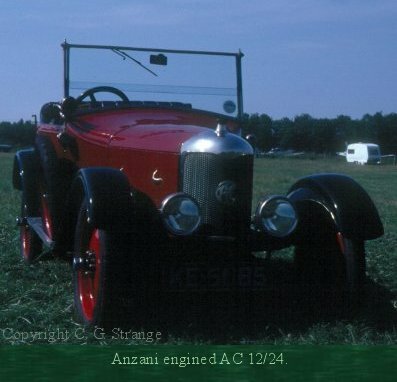 The new 6 cylinder engine needed further development, so car production continued with the Anzani engine. With these cars, Autocarriers made a name for themselves as producers of good quality high performance cars, capable of 60mph. A variety of body styles were offered, and the model names applied were "Royal" and "Empire", although model naming became more and more confusing as the decade went on! In 1921, S. F. Edge joined the board of Autocarriers. Edge was famous for his work with Napier cars, using competition success to help business to flourish. In 1922 Weller and Portwine resigned and Edge became chairman of the company, which was renamed again, "AC Cars Limited". This was the start of a period of record breaking runs and competition successes. Large numbers of records were set on-track (Brooklands) for high speeds maintained for long distances, for a light car. 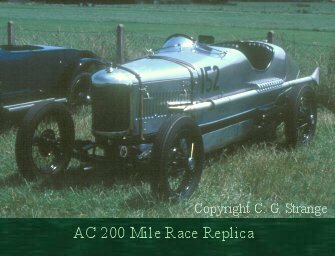 Most notable was a single seater AC covering 100 miles (160km) in 1 hour, from a standing start, at Brooklands. By 1922, the AC 6 cylinder engine was well and truly into production. This was also used in record attempts, in particular, endurance tests. 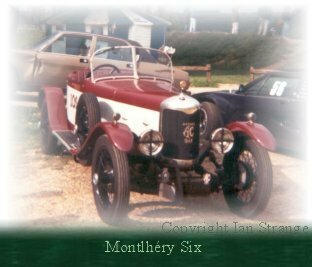 In 1925, a test was carried out at Montlhéry, France, in a special car since known as the "Montlhéry Six" covering an amazing 2000 miles (3200km) in 24 hours. Not surprisingly, this was a world record! 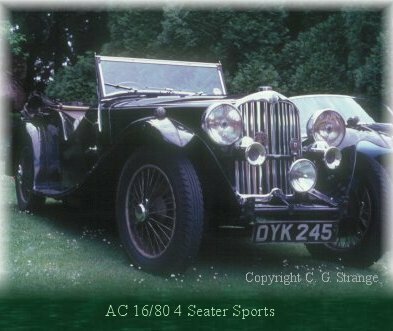 That same year, an AC six became the first British car to enter the Monte Carlo Rally, and the following year, was the first British car to win that rally (driven by the Hon Victor Bruce). The company name changed again in 1927 to "AC (Acedes) Cars Limited". 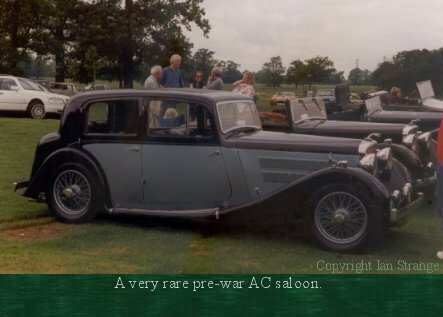 The 6 cylinder cars made up most of the production by the late 1920s, and in true coachbuilding tradition, a lot of different styles were offered: "Fabric Saloon", "Sedan", "Aceca", "Royal" (again!) etc. In 1928, the styling was updated with a flatter radiator, and the relatively large "Magna" model was launched. By this time, the superb 6 cylinder engine had been improved by the addition of a crankshaft adaptor on the rear of the crankshaft. This permitted an extra main bearing to be added, making 5 altogether. A vibration damper was also incorporated into the flywheel. AC's designer Sidney Smith was responsible for these improvements. In 1929, AC was in financial difficulties, and the factory closed and went into receivership, although the service department continued to operate. In 1930, AC sprang back to life. The company was taken over by William Hurlock along with his brother Charles. Initially run for servicing only, they then decided to resume production of the Magna. Within months, design improvements were made including a 4 speed gearbox in unit with the engine - rather than on the rear axle. Also, half-elliptic springs all round. Then by 1933, chassis became lower slung and were numbered with a prefix letter "L". Whether or not this actually meant "Low" is not clear. By this time, the 6 cylinder engine was producing 56 or 66bhp providing over 60mph for touring cars. Engine components developed steadily, such as the adoption of roller cam-followers, eccentric base cams and better pistons. In the 1933 RAC Hastings Rally, an AC driven by Miss Kitty Brunel won the event outright, despite actually being in class 2. Three other ACs also won prizes in that event. In 1933, an improved range was launched featuring a chassis underslung at the rear, which gave a low gravity centre and very attractive lines to every version of the model. It was in fact a chassis from Standard of Coventry, which was also employed by SS for their sports cars. Chassis numbering continued the "L" prefixed series, despite being a different design. Maximum speeds exceeded 75mph and they had a great reputation for road-holding and handling. Saloon versions known as "Ace Greyhounds" were also offered, including a very sleek "Aero" saloon. Not necessarily aero-dynamic, but it looked good! 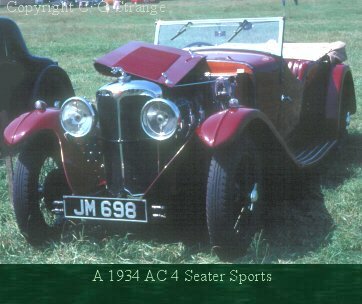 Then there was the "Earl of March" open 4 seater sports with its classic sports car lines. During this period, AC were building cars in very small numbers, tailored to each customer's requirements. One of AC's slogans was "The Saville Row of Motordom". 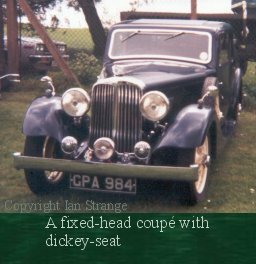 Styles included fixed-head and drop-head coupés, short chassis sports, pillarless saloons. You would be hard pressed to find two ACs of the 1930s that were alike! The coachbuilding was, however, done efficiently, so each car was not literally redesigned from the ground up. This helped to maintain competitive pricing, especially in the face of stiff competition from SS. As well as high build quality, there was much attention to detail. Pedals had pivoted heads and the AC logo. Wire mesh lined the inside of the wings to prevent slush rebounding onto the outside of the bodywork. By 1936, additional silencers were mounted on the exhaust manifold. The body styling was updated almost year by year, and more practical improvements included increases in passenger compartment space. Triple SU carburettors had already been optional, but by the mid 1930s had become standard. 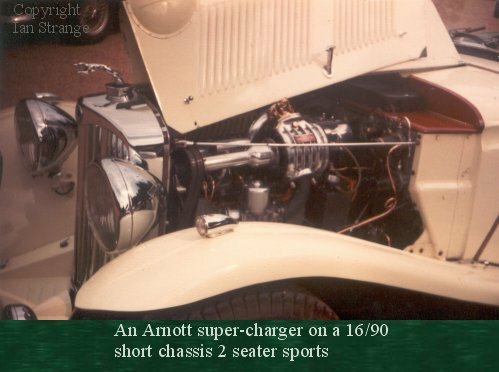 Power output was between 60 and 80bhp, or for a few of the short wheelbase sports models, there was a 90bhp option with an Arnott super-charger. In 1937, AC started to export cars to the USA. The short chassis 16/80 sports models kept up AC's reputation for competition success and also picked up a nickname, "The Flea". Its wheelbase was 8ft 10in, compared to the longer chassis in production of 9ft 7in. The "Flea" weighed in at around 20cwt (1016kg) and could reach 90mph. An optional Greyhound mascot was available, often fitted to Aces, just to confuse the model naming as always! It is easily mistaken today for a Jaguar mascot, "..no it's not a Jag!" is the familiar AC owner's cry! Models are more usually referred to by their power rating (RAC/bhp) and the body style, such as a 16/70 4 Seater Sports. 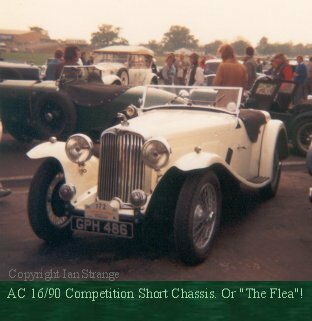 I think there were 3 versions of the chassis: The 9ft 7in wheelbase used for most models; a wide version for the saloons; the 8ft 10in wheelbase chassis for the competition cars. With increasing demand, and competition, for a car that combines sports performance with spacious comfort, a new chassis design appeared in 1939. This was over-slung at the rear, had soft springs, and the passenger compartment was much larger than in previous models. Unfortunately it lacked the sleekness of its predecessors, (shorter bonnet and helmet-style wings) but in any case its production was interrupted by the outbreak of war in 1939. Even before the outbreak of war, AC Cars were doing their bit! Government contracts kept them busy making aircraft components, fire trailers, and subsequently the coachwork for fire engines. Once war was declared, all production was turned over to these contracts. To cope with demand, an additional factory at Taggs Island (on the River Thames) was taken over. The war contracts meant that there was no chance to resume car building straight after the war ended. But design work for the new post-war model did get under way quickly and it started to appear on the roads from late 1947. Much of the above history is sourced from Jock Henderson's "History of AC Cars" (1952). This appears to have been the major source of reference for countless AC books and articles over many years. Jock Henderson was the Sales Manager for AC, and was with the company from the 1930s to the '60s. Other sources were old AC adverts and numerous articles by John Mclellan (which were often the truth behind the adverts! ).